It’s fascinating being here, as the political landscape is slowly shifting with the proliferation of social media tools and the ensuing sense of increased engagement with the political process. The newsmaker events that Reuters have been running of late have been getting increasingly deep into the potential and possibilities of social media tools for connecting the electorate with the people who supposedly work for us. So today will hopefully be a great chance to think about, discuss and discover some new ways that emerging technologies can further the cause of transparency and accountability in government. [12:59] We’re setting up, things kick off at 2 – sorting out the wireless, getting Audioboo set up, sorting out tech issues, and generally working out how things are going to run. [2:12] lots of people here now. I’m still faffing with trying to get audioboo working… got a web login for the iPod touch at last. Hurrah! [2:48] the session next to me is a discussion on how best to use some European parliament funding to get young people using social media to form policy online – net neutrality, freedom vs democracy, censorship etc. The belief being that kids have more idea of how this stuff works online. “young people haven’t disengaged with politics, politics has disengaged from young people” – what a great quote! [3:03] some great stuff appearing in the twitter search for picamp. [3:30] fascinating to hear those who work in government talk about the massive frustrations with policy formation, public consultation and document formation. [5:45] this just came up on twitter: “trust is major issue in bottom up politics” – I was surprised there wasn’t more talk (that I heard) today on issues of trust and reliability of online personalities and presences. In politics, the stakes for inauthenticity are so much higher – we talked a bit about it in the discussion about drawing lurkers into the conversations on Slugger O’Toole, by thinking about the pros and cons of anonymity online, but not much was said about how to verify and authenticate political presences. These are discussions that will hopefully contine from here. Steve – thanks so much for compiling and curating discussion and commentary on this afternoon’s session. Really useful to have someone there to document what the rest of us were experiencing but not having time to write up. Found myself abandoning the idea of doing voxpops and putting together a video package … even found myself not tweeting. So your record is really useful. Thanks for sending this – will listen to the audio clips later. 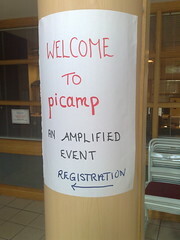 I had to leave Picamp earlier than intended to deal with a sudden legal query about something I’d written last week which I’ve just sorted. I really only participated in the first citizen journalism session which was very stimulating. Be in touch later. BTW enjoyed seeing faces not avatars! Thanks for the summary of the day: stellar work!